Product typology: the cap you suggest shall allow an easy opening (“easy-open” cap), without requiring the use of a bottle-opener or similar. The cap will be employed for standard size bottles (see Size paragraph for more info), used for beer, soft-drink or other beverages. In addition to perform its function, it shall arouse curiosity in the consumer paying great attention to the user experience and suggesting a fun-related use. How to use: the user shall be able to easily remove the cap, through a pry-off gesture, without using any bottle-opener. You are free to suggest alternatives to this method, making sure that the gesture is safe and easy for the final user in all circumstances. Shapes: keep into consideration aspects related to ergonomics and intuitiveness of use, that shall be embodied by the cap design, in order to ease its opening. Size: the cap shall be compatible with bottles with neck-finish of 26mm or 29mm. In the Material files you’ll find the 3D file of two standard neck-finishes ( neckfinish-26mm.step and neckfinish-29mm.step ) that you can use to start building your cap. Materials: you are free to suggest single-material or multi-materials solutions at your discretion, keeping into consideration the use of possible eco-sustainable materials and in view of the product recyclability. For getting an idea of the materials currently used by Pelliconi in the easy-open Maxi P-26 cap, take a look at the presentation attached in the Material files. Style and customisation: the cap shall be intended for several brands and beverages, accordingly you are invited to suggest an innovative and highly aesthetic design, that may leave room for client-brand customisation, reserving an area for the logo, custom colours, etc. Today, the areas devoted to this use are the top side of the cap, the inner part, the side and the colour juxtaposition of various components. For some examples of customisation, please refer to the presentation of the Maxi P-26 cap attached in the Material files and to the Inspiration tab. Participation is free of charge and open to designers and creative talents of any nationality aged 18 years or older. Participants can present one or more projects, but only the projects published on the www.desall.com web site, via the upload page related to “Future Cap Challenge” will be accepted. The selection of the winner by Pelliconi will be the result of an unquestionable evaluation and it will take into account originality, feasibility and consistency with the brief presented. 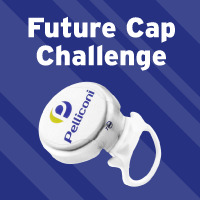 Do you want to stay updated about "Future Cap Challenge"?